Small specialist organisations will get new UK funding so they can help aid workers on the frontline respond to humanitarian disasters, the International Development Secretary Penny Mordaunt has announced. She has also laid out her vision for the Great Partnerships initiative, setting out “what we could achieve if we enabled all that our nation has to offer and put it behind the delivery of the Global Goals”. 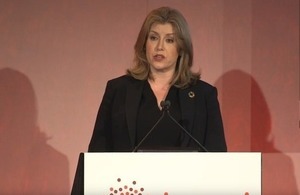 In a keynote speech at the Bond Annual Conference in London last week (Monday, 18 March), Ms Mordaunt confirmed that DFID will support members of the Humanitarian 2 Humanitarian (H2H) network, providing the network with £3.35 million over three years. H2H is made up of small international organisations, providing specialist services, such as mapping and translation, in disaster zones to aid agencies. A quarter of the not-for-profit organisations are British. DFID will make it easier for small, innovative organisations doing heroic work to respond to global disasters by becoming the first government to provide funding - over £3 million - through the H2H network. We’ve world class organisations, specialists in things like mapping and translation. The services they supply can often mean the difference between life and death. This funding will help them get on the ground more quickly and support the delivery of life-saving aid on the frontline. When a humanitarian crisis occurs, DFID will work with the H2H Network to identify the types of services required. Ground Truth Solutions, which helps bring the perspective of people affected by crises into the planning and management of humanitarian emergencies. The H2H network, made up of 60 organisations, was founded in 2016 to support innovative approaches to drive better quality humanitarian responses. Ms Mordaunt also announced at the Bond conference speech plans to lift the current funding cap on the Small Charities Challenge Fund (SCCF) to support outstanding, small, grassroots UK charities working in developing countries. The fund makes it easier for small UK charities to access the aid budget, helping them to unlock new partnerships and fresh thinking. It was launched as a £4 million pilot programme in July 2017, and gives charities grants of up to £50,000. It is often small organisations that are the most innovative, the nimblest, and who create the strongest connections. And there is some amazing work going on. In every community across the UK there are amazing people inventing new ways to solve problems and improve lives. And as I travel around the nation I see pictures of development projects on the walls of offices, pubs, schools, community centres and places of worship. I think there is great strength in helping those Britons connect with the rest of the world and enabling hundreds of smaller organisations, many community-based, that make up the lion’s share of the UK’s international charity action, helping those organisations to achieve their ambitions. We have already piloted a small charities fund and this summer we will be launching an improved fund in full. It will be nimbler, easier to apply to, open, and have a rolling application process. And I’m so confident in the merits of such a course, that we will commit to expand the fund to meet demand. There will be no cap. If you meet the grade, if you represent the best of British, you will have the funds you need to deliver the Global Goals. And I want every community in the UK to be able to establish that connection and show the world what Britain is about, and a larger share of my budget in future will go to those small charities who do so much with small sums. Ms Mordaunt referred in her Bond speech to charities which have already received SCCF funding. They include Interburns, a burns specialist charity from Wales, which is working with the Ethiopian government to introduce a national strategy to prevent and treat burns – one of the leading causes of disability among Ethiopian children. At the speech, the International Development Secretary also outlined her vision for the Great Partnerships initiative. There are many things about this nation that I am proud of - not least the huge number of citizens that support your organisations and give to charity every year. But in addition to that it is our talents, our technical expertise, our science base, our great institutions and organisations that make me proud. And it is what they bring that makes us relevant to so many nations around the world. From the City of London, to the Royal Society, from the Health and Safety Executive, to the Scouts, from the Football Association to the NHS to the Tree Council, to the Met Office, we have technical expertise to every problem on Earth you care to name. On Friday I visited the RNLI in my hometown of Portsmouth. As well as saving lives in the UK for nearly 190 years they have helped more than 30 nations around the world build services and systems that prevent drowning and rescue people. It’s a great partnership that they have. In return for building capacity in other nations they get to build capacity at home by learning new skills and creating new innovations. And that can be said for so many other organisations, whether they sit in the private sector, the public sector or the third sector. Just think what we could achieve if we enabled all that our nation has to offer and put it behind the delivery of the Global Goals. That’s the aim of the Great Partnerships initiative, working out how we connect people, our discoveries, talents, skills and knowledge to the relevant problems and opportunities across the globe. The Bond Annual Conference is the largest international development conference in Europe bringing together more than 1,000 people from across the international development and humanitarian sectors.